When the Community Cycling Center began partnering with Lam Research Foundation in 2014, Steven Soto was their first employee in line to volunteer. Since getting his start on Tuesday Drop-In Night, he’s stepped up to help clean, refurbish, transport, and distribute bicycles in the community. He’s often joined by his son, Luke, who’s favorite subject is math. 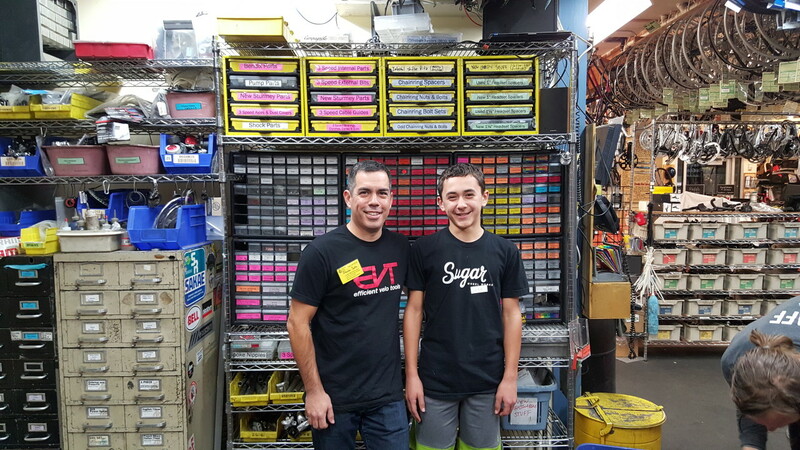 Steven was instrumental in supporting the Cycling Center’s acquisition of the donated shelving and storage bins that have allowed for a remarkable improvement in the cleanliness and organization of the tons of used parts that we process each and every day. We want to honor Steven’s commitment to our organization in this month’s volunteer spotlight. I love bike riding and the benefits that it provides. The personal benefits (from a healthy, economic, and rejuvenating form of transportation) I get from cycling should be available to all, and I really believe in the CCC’s mission. It also gives me a chance to show my son the benefits of volunteerism and community involvement. Tell us about Lam’s involvement with the Community Cycling Center. I am very fortunate to work for a company with a deep commitment to the communities where its employees live and work. Lam Research (through the Lam Research Foundation) has supported the Holiday Bike Drive (HBD) the last two years. Their support has been both financial, and through encouraging employees to volunteer their time at the CCC. In addition to direct contributions to the Holiday Bike Drive, Lam Research matches employees’ donations dollar for dollar, and matches volunteer hours with a $10 per hour donation. Lam also helps organize employee volunteer opportunities to make community engagement easier for its employees. Most of my volunteer work at the CCC is repairing and rebuilding bikes for the Holiday Bike Drive. I became certified as a HBD mechanic this past year and I can now teach others how to do the same. The Holiday Bike Drive event is very special, and motivated me to get more involved with the CCC. Watching the excitement as children get what is often their first bicycle is so much fun. Although most of my personal time is spent with the Holiday Bike Drive, the Earn a Bike program is my favorite – it directly enables motivated people that lack sufficient means to get on a bike that they can call their own. A great community is one where everyone has the same opportunities available to achieve their dreams. Access to community services and infrastructure are not defined by your address or your income. To me, community means not just diversity, but true integration of diverse backgrounds. I use a bike for so many different things, so I don’t have a “dream bike”. A modest bike that fits well and is perfectly adjusted by a good mechanic is a dream to ride.